Hawksbill Crag aka Whitaker Point! This is THE most iconic spot in the state. 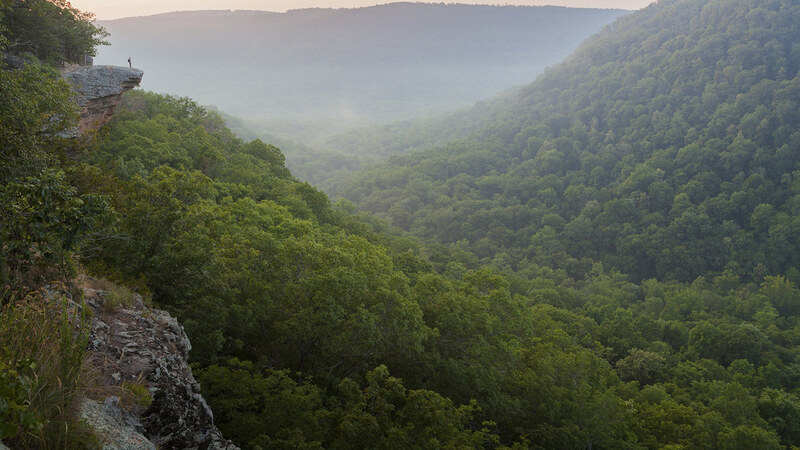 When you see advertisements for the Arkansas Outdoors you will typically see photos of Hawksbill Crag assembled behind various text placards and body copy shouting about how great Arkansas is. And you know what? They’re absolutely correct. This State is by far one of the greatest places to get intimate with your surroundings in the outdoors. Even with all the beauty the west holds, nothing can compete with the feeling of being one with nature as you’re hiking through a dense Arkansas jungle, down the shores of Greers Ferry Lake, or standing on the point of Hawksbill Crag! It’s a paradise in it’s own right. Many people never see the beauty that is the Natural State, because they are so caught up in the rat race of their daily lives. Get out people, free yourselves from the corporate shackles of oppression. If only for a weekend! That’s exactly what Robert Dudley and I did on this trip to Hawksbill Crag. He hinted at a trip he was taking with his father a month before going and made mention that if anyone wanted to come along they could. Of course I didn’t turn down the opportunity to go hiking in our great state. Hawksbill Crag is a place I’ve visited numerous times, because quite honestly, it’s incredible. Which is funny, because I tend to shy away from places where there are thousands of people hiking; it’s just annoying fighting with everyone for a photo. I like to go to the less known places and bring back something worth showing off, not something that 1 million other people have captured the same thing of. That mentality makes it a challenge for me, because I’m always pushing myself to capture something not everyone else has. This particular case, I know other people have a photo similar to this, but hey… I do things MY way! Kevin Solomon, the man featured in the photo, is another friend of ours that went along for the hike. We both hiked ahead of the group and arrived pretty early at the crag. I looked at him and said, Kevin, go hike out to the crag, I have GOT to get a scale shot of this place. And you know why… everyone who visits here get’s caught up in the moment and zooms WAAAAY in on the crag and takes a mediocre photo. Who cares, right? It’s just a rock. However, place that rock in it’s natural surroundings with a person standing on it for scale and BAM, there YOU are standing on that rock imagining the greatness that is Hawksbill Crag. Download this wallpaper now to experience it yourself for a while. It’s great putting yourself in Kevin’s shoes, standing there looking over this magnificent valley. Possibly shouting at the top of your lungs to hear the wondrous replies of your own voice as they echo throughout Whitaker Hollow and along Lower Fork Creek. Just don’t do that while sitting in your office chair, yeah?